If we were to visit any one of the European countries such as the UK, Germany, France, Holland or Poland, we would most likely easily run across Gaminator slot machines. This is because the Gaminator slot machines are tremendously popular throughout Europe. In the US, these games can certainly be found in Las Vegas, Atlantic City and any other popular gaming locations. Made by the Novomatic company, the Gaminator slots include a lot of the most popular games of today. One of the reasons for the Gaminator’s popularity is the big prizes that come with a bonus. 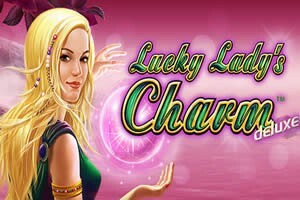 Of all the Novomatic games, Lucky Lady’s Charm Deluxe is one of the bestsellers. Originally, the Lucky Lady’s Game was a game of the brick and mortar casinos. However, an online “Deluxe” version was recently launched. The two versions are basically the same except for the number of the game’s paylines. The game’s popularity is no surprise because of its many opportunities of winning a bonus, generous payouts, and its highest return to player rate average boasted by Novomatic. The mysterious world of fortune telling creates the intriguing theme of this game. The game Lucky Ladys Charm Deluxe actually tells a captivating story of a beautiful girl who desperately needs a fortune favor. How does she go about finding this fortune favor? In her fascinating story, she uses true sorcery and amulets of all kinds whose symbols are seen on the reels while playing the game. Appearing on the screen are the Lucky Lady and both her fortune telling accouterments and lucky charms including a horseshoe, ladybug, four-leafed-clover, gold coin, lucky rabbit’s foot and a crystal ball. Also included are the playing-card, slot symbols of A, K, J, Q, 9, and 10. The central character is a female and the usual color of an online slot with a female central character is pink. Novomatic Slots has followed suit, but the pink is a dusky pink that is pleasing aesthetically. With the reels having an unadorned white background, the symbols are made to stand out. Both the audio and visual effects of the online, deluxe version of this game are state of the art creating a fascinating improvement over the old brick and mortar version. The online, deluxe version of this slot game has 5 reels and 10 paylines using common gameplay. The game was limited by its developers to the standard keys and functions. Lady Luck is, of course, the main and key character of the game. 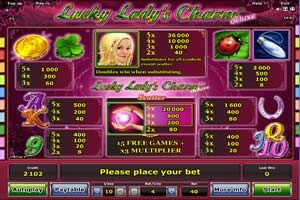 If on any active payline you manage to get over three Lady Luck’s, you can expect a big bonus. Lady Luck is also the Wild symbol of the game. This means that the Lady Luck symbol can create a winning combination for you since it can be a substitute for any of the other symbols. The online, deluxe version of this online slot game has 5 reels and 10 paylines using common gameplay. The game was limited by its developers to the standard keys and functions. Lady Luck is, of course, the main and key character of the game. If on any active payline you manage to get over three Lady Luck’s, you can expect a big bonus. Lady Luck is also the Wild symbol of the game. This means that the Lady Luck symbol can create a winning combination for you since it can be a substitute for any of the other symbols. The general rule of getting a win is to get a combination of two to five matching symbols across the reels. The game requires at least three matching symbols for a win, but you need only two of either the Lucky Lady or Ladybug symbols for a winning combination. The scatter symbol is the crystal ball. The matching symbols must be across the reels for a win except for the crystal ball, scatter symbol. As the name eludes, the scatter symbol, crystal ball, can get the player a win if three or more of them appear on the screen. In other words, three or more can be scattered on the screen. Fifteen free spins are launched by three or more scatter symbols. If you catch the crystal ball when playing free spins, you win more free spins. 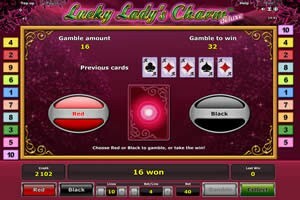 Another feature of Lucky Lady’s Charm Deluxe is its gamble that gives the player a chance to double their winnings. To double your winnings, you must guess the color of a hidden card. You have a 50% chance of doubling your winnings since the card is either red or black. If you guess correctly, you double your winnings. 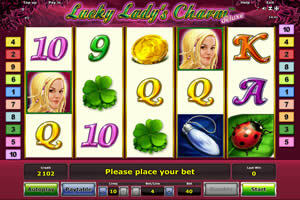 If you are a fan of slot games, you would certainly enjoy playing the Lucky Lady’s Charm game. Many of the major gaming establishments offered the original version and it quickly became a bit hit among players of brick and mortar casinos. However, the original was not nearly as captivating and fascinating as today’s updated, deluxe version. The game can be found on many online sites that offer the opportunity to play it for free. So, why not try it? Once you have mastered how to play, you can try your luck by playing for real profit and also have lots of fun trying.